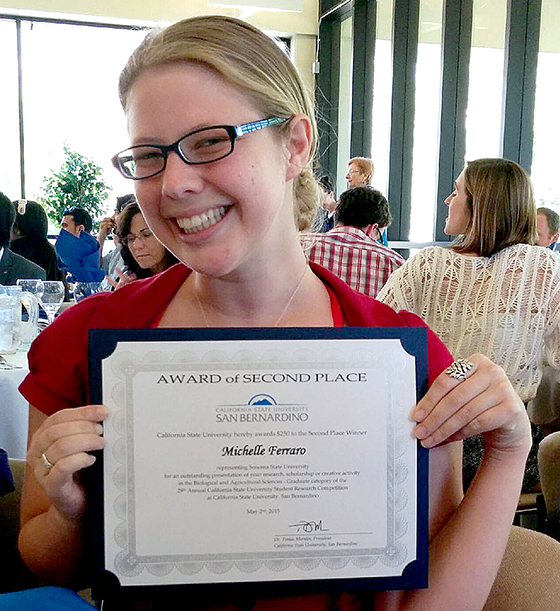 Sonoma State University biology master's student Michelle Ferraro took home second place (and a $250 prize) in the graduate division for biological sciences at the 29th annual CSU Student Research Competition, held May 1-2 at CSU San Bernardino, for her presentation titled "Evaluating Optimal Foraging Theory in a Free-Roaming Marine Predator." The competition featured over 250 participants from all 23 CSU campuses. Undergraduate and graduate students competed in separate divisions by discipline. Ferraro is mentored by biology professor Dan Crocker. SSU's representatives at the competition also included: Isabel Sanchez, "Public Perception of Police in Contra Costa County"; Samuel Sanchez, Michael Huang and Heather Timmons, "Patterns in Forest Taxa: A look at two species of Herptofauna"; Brian Lavin, "Around the World in 50 Million Years: Biogeography, Molecular Dating, and Species Delimitation in Glass Lizards (Anguinae);" Kathleen Grady, "Avian response to small-scale riparian restoration in Marin and Sonoma counties"; Penelope Wilson, "The Effects of Environmental Enrichment on Captive Lemurs"; and Adriana Lopez, "Effects of Alternative Rearing Strategies on Captive African Ungulates." The competition is held each year in May and highlights the varied research conducted in the CSU system by faculty and students. Interested students and faculty can contact Elaine Sundberg, or David Hartranft for more information.